Sometimes you just know when to go against a team no matter how good it is playing at that particular time. That is why I went against Edmonton last week as the only undefeated team in the CFL to cash in on my free weekly pick for Doc's after the Eskimos fell to Winnipeg 33-26 as slight one-point road favorites. I also know that Edmonton is still one of the best teams in the league, so that is why I am jumping back on its bandwagon in Week 10. This week's CFL betting action gets things going on Thursday night with an inter-division clash between the 6-2 Winnipeg Blue Bombers and the 3-5 Montreal Alouettes. Winnipeg comes into this game with a 6-2 record against the spread as well, and it has been opened as a slight one-point road favorite with the total set at 54.5 points. The total has gone "over" in six of its first eight games as one of the highest-scoring teams in the CFL. The Alouettes fell to an even 4-4 ATS with last week's 38-6 loss to Toronto as slight 1.5-point road underdogs. The total stayed "under" the 50.5-point closing line in that loss, and it has stayed under in three of Montreal's last four games. The only game that went over during that same span was a tight 41-40 loss to the Blue Bombers on July 27 as a four-point road underdog. In the first of two CFL games on Saturday, the 5-4 British Columbia Lions will go on the road as one-point underdogs against the 2-6-1 Ottawa RedBlacks, and the total for this inter-division matchup has been set at 55 points. BC has lost three of its last four games SU, but it was able to salvage a 'push' against Calgary in last week's 21-17 loss as a four-point underdog at home. Ottawa snapped a three-game SU skid last week with a solid 37-18 victory against winless Hamilton as a3.5-point road favorite. The RedBlacks improved to 6-3 on the year ATS, and their six SU losses this season have been by a combined 20 points. Later on Saturday, the Toronto Argonauts will square off against Calgary in another inter-division tilt. The Stampeders are 6-1-1 SU (4-3-1 ATS) and just a half game in back of Edmonton in the West, while Toronto actually leads the East Division at 4-5 SU (3-6 ATS). The current spread for this game has Calgary listed as a 10-point home favorite with the total set at 55. Saskatchewan comes off a Week 9 bye as a 6.5-point road underdog against Edmonton in a 9 p.m. (ET) start at Commonwealth Stadium this Friday night. The total for this West Division battle is set at 54 points. The Roughriders turned in an impressive performance before last week's bye in their 41-8 pasting of BC as three-point underdogs at home. They are 3-4 SU overall with a 4-3 record ATS, with three of those four losses coming on the road. Veteran quarterback Kevin Glenn threw for 320 yards and three touchdowns in the win at home against the Lions. However, in a 30-15 loss to BC on the road the week before as part of this home-and-home series, he was held to 186 yards passing and zero touchdowns while getting picked off twice. Edmonton's first loss of the season dropped it to 7-1 SU with a 3-5 record ATS. 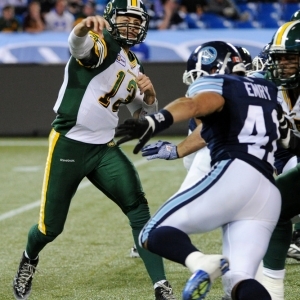 The Eskimos have had their fair share of close calls this season, but they remain a perfect 4-0 SU on the year at home. Mike Reilly is ranked third in the CFL in passing with 2,685 total yards, and he is second in touchdown throws with 15. He is the type of quarterback that can get really hot early and carry that success for all four quarters to put some points on the board. Edmonton has scored 33 points or more in each of its last two home games. Saskatchewan is just 8-17-1 ATS in its last 26 road games, and it has failed to cover in five of its last six division games. The Eskimos have gone 12-4 ATS in their last 16 games coming off a SU loss, and they have a 9-4 edge ATS in their last 13 home games against the Roughriders. This will be the first meeting this season. This will be Edmonton's first game of the season coming off a SU loss, and you get the feeling that the Eskimos have something to prove with Calgary breathing right down their neck in the division standings. I am going to lay the 6.5 points in this one and take Edmonton to cover this week.